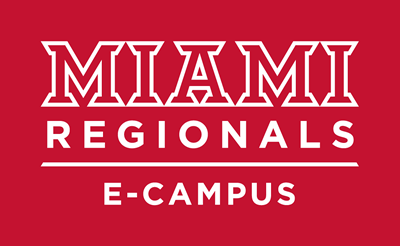 The Miami Regional E-Campus office is the hub for all online and hybrid courses and programs at the regional campuses. We work with faculty to create interactive and rich online and hybrid learning experiences that allow students a more flexible Miami learning environment. Our office provides faculty training and support while monitoring online and hybrid course compliance. We use Quality Matters as a guide to our quality online experiences. Miami's Regional Campuses are accredited by The Higher Learning Commission and are members of the North Central Association (312) 263-0456. Online courses are completely online and do not require you to attend a regular class meeting. Online courses are offered through a password-protected collaborative learning environment called Canvas. Course content is available 24 hours a day and communication takes place in a variety of ways. The advantages of online courses include: flexibility, mobility, and accessibility. Keep in mind these courses can be very time consuming and require discipline and good time management to complete. These courses are designated in the Course List with an attribute of Online Course (ONL). View online courses at www.admin.miamioh.edu/cfapps/courselist/ or at www.regionals.miamioh.edu/courses/#schedules. Hybrid courses allow students and faculty the ability to interact in person and online. Hybrid courses require students to meet face-to-face some of the time in a classroom; the remaining time is spent completing coursework online. The percent of time spent in a classroom will vary from course to course. These courses are designated in the Course List with an attribute of Hybrid Course (HYB). The amount of time spent in class is listed in the notes section below the course information. View hybrid courses at www.admin.miamioh.edu/cfapps/courselist/ or at www.regionals.miamioh.edu/courses/#schedules. Two-way interactive videoconferencing courses allow you the opportunity to take a class in real-time from a remote location. These interactive video courses require you to attend in-class sessions either at one of Miami Regional Campus locations or at one of the off-campus locations. The in-class sessions are offered through two-way video and audio conferencing between the site where the instructor is located and the remote sites.